No one sees it happen in the twinkling of an eye. A seed falls to the ground, the rain falls from the sky. The sun shines down its brightest, day after many day. 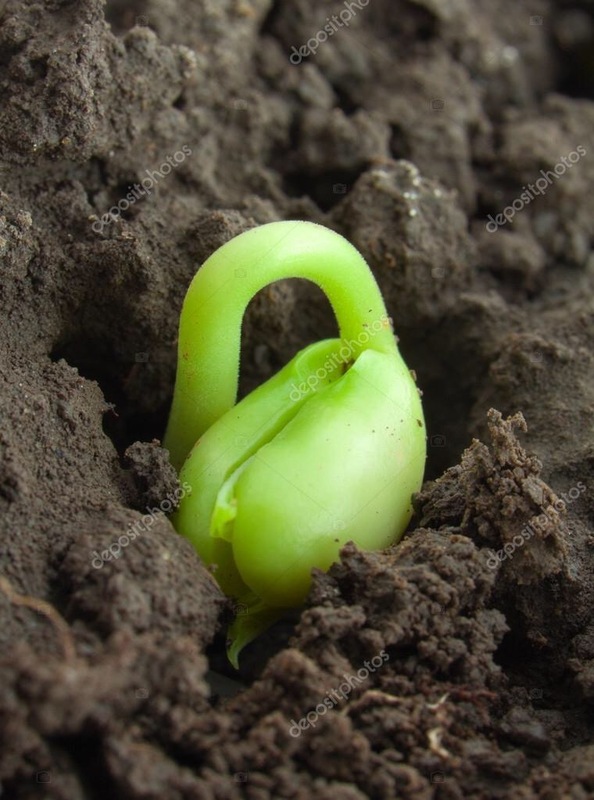 And beneath our feet, that seed cracks open, life is on the way. The roots go down in search of water, the sprig, up, in search of light. No one sees it happen, many people pass it by. Beneath our feet that little plant reaches upwards towards the sky. It pushes through the darkness, soaking in the morning light. Then walking by, I look down; I see a little green. How slowly and discreetly has faith sprung up in me. As quiet as a growing seed right beneath my feet. It was the summer of 2016. My husband’s birthday and my birthday, a week apart, had just passed. The sticky heat of Florida summer had me praying for rain. We lived in the country with wildflowers and wild animals; it was lovely and I truly enjoyed it’s beauty. Two days after my birthday a tragedy involving my husband brought me to my knees in the middle of the night. It was too much. I wailed at God. I’d like to say I was hanging on to life by a string, but that’s not true. God was holding me up because I had no strength left. I felt alone and broken. But what I had failed to notice through my tears was that God had seen all of this coming long before the days of summer. God had put a vision in a woman’s heart to send me a Loved Bible. At the time I’d never seen or heard of “The Loved Bible Project”. I’d also never communicated with the woman who mailed it to me in the beginning of September. 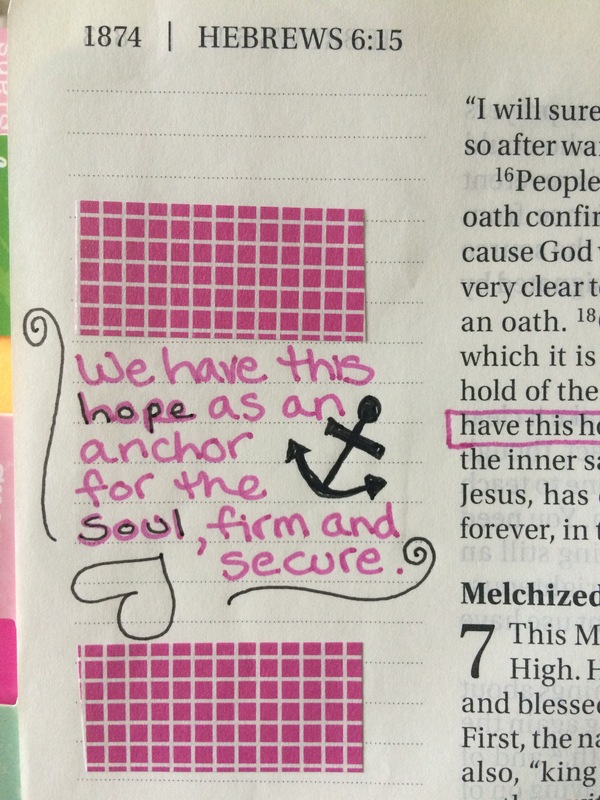 This Bible was beautifully decorated with scriptures highlighted, fancy ribbon, and special notes written just to me. Imagine my shock. 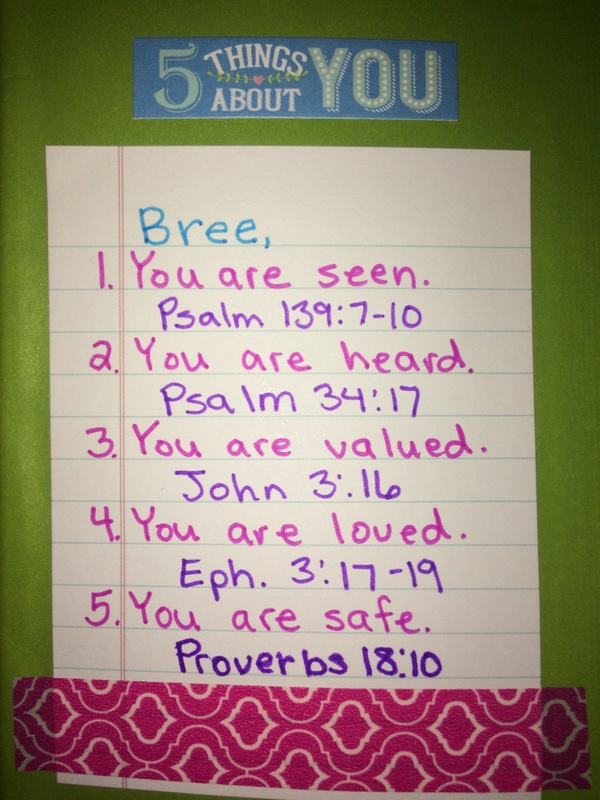 Why would anyone, especially someone who didn’t know me, take time to create this beautiful Bible for me? As I read it daily, it’s words sank deep into my heart, patching the aching holes that fear had caused just weeks earlier. It was, to me, a gift like no other, of the upmost importance. 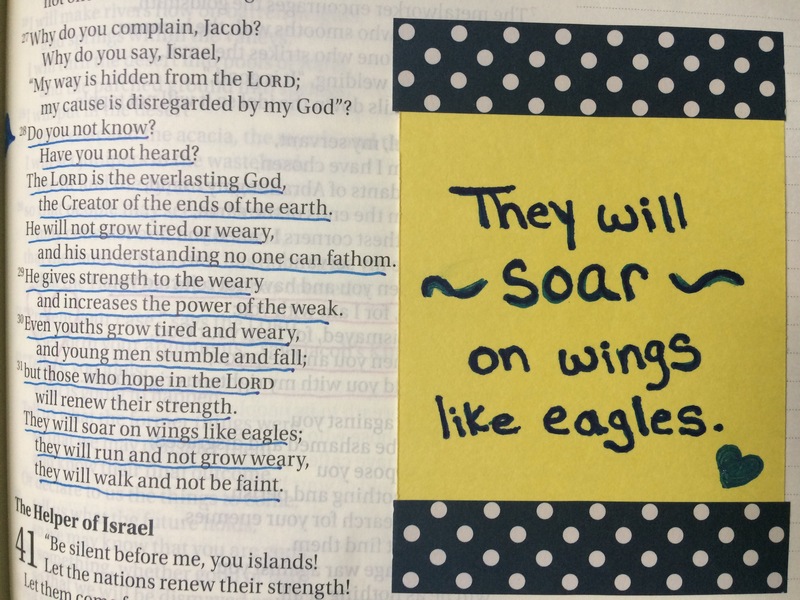 This Bible, that seemingly came out of nowhere let me know that God knew what I was suffering. God was with me. About a month later, following more problems, I decided to leave my marriage. I didn’t take much with me, but I certainly grabbed my Loved Bible. 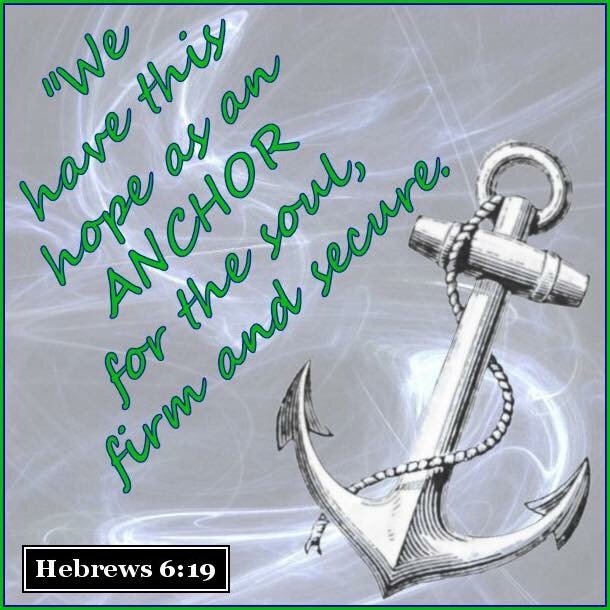 I walked away from my life, everything I knew, and followed the Holy Spirit down a path I’m still on today. I’ve arrived at a point of rest where God has asked me to “be still” and wait on Him. With time on my hands, I pray and read a lot. I especially read my Bible. 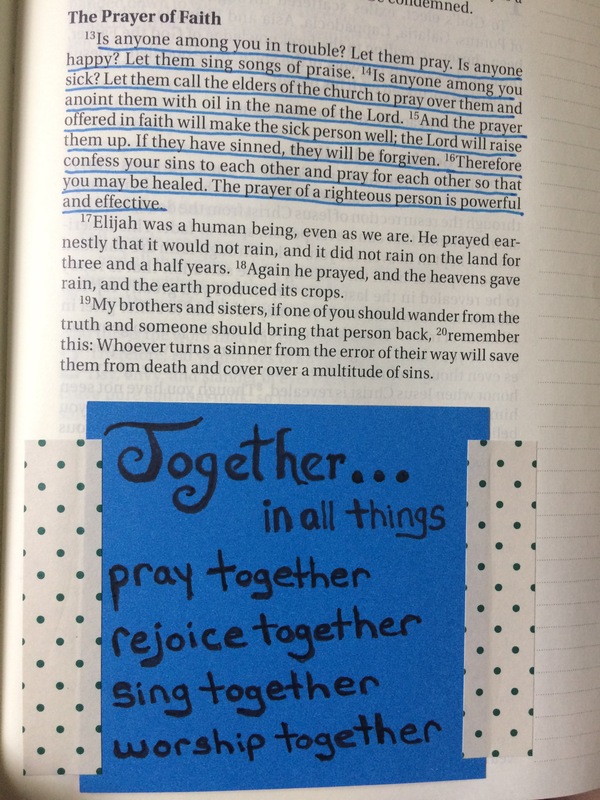 While praying, I decided I wanted to make a Loved Bible for someone else, someone specific I was praying for. 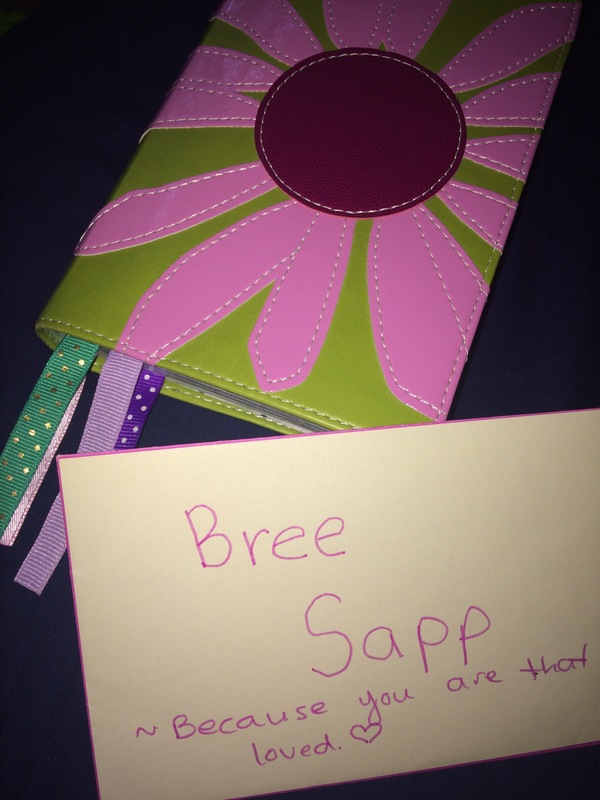 I got a Bible, pens, stickers, washi tape, notecards, and lots of ideas from The Loved Bible Project Facebook page. Then I got stuck. 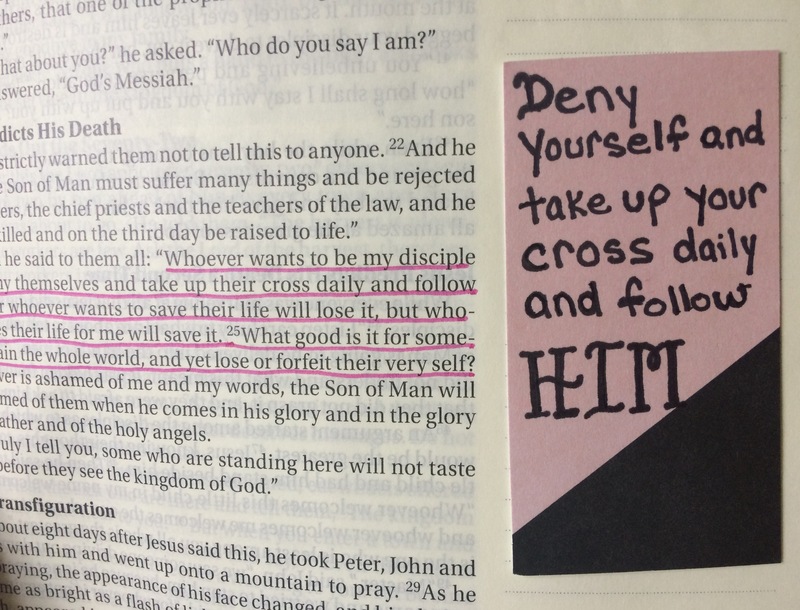 I just couldn’t do it, I was afraid to ruin the Bible by writing in it. I was afraid that I would mess it up, or do the wrong thing. I had all these plans, my favorite scriptures, great ideas, but fear took over. Weeks passed. Finally, I did it. 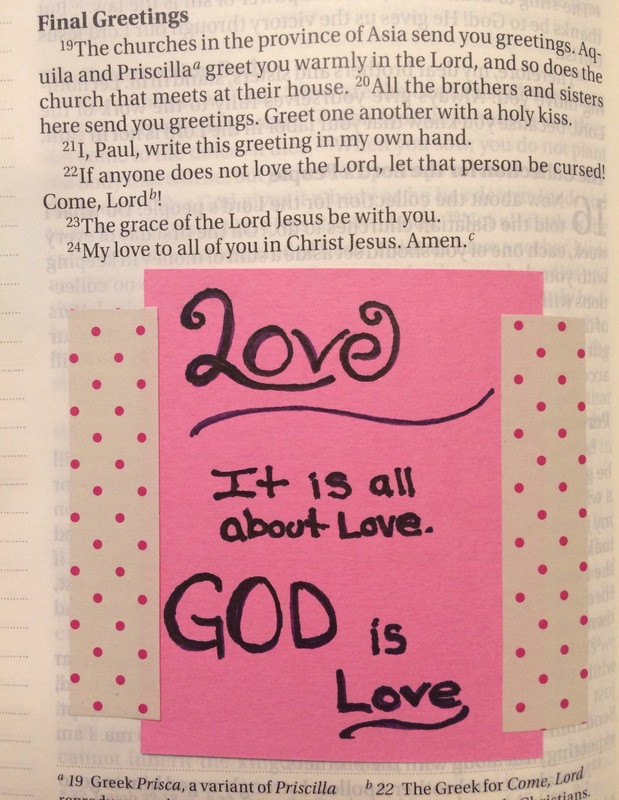 I created my first Loved Bible page! It was exhilarating! I was so excited. I drove a couple of people crazy by messaging pictures of every page I created. Now I can hardly stop. It is so much fun and something I look forward to doing every day that I can. In fact, I think I need to start a new Loved Bible before I completely fill this one up and leave no room for its recipient to take their own notes. 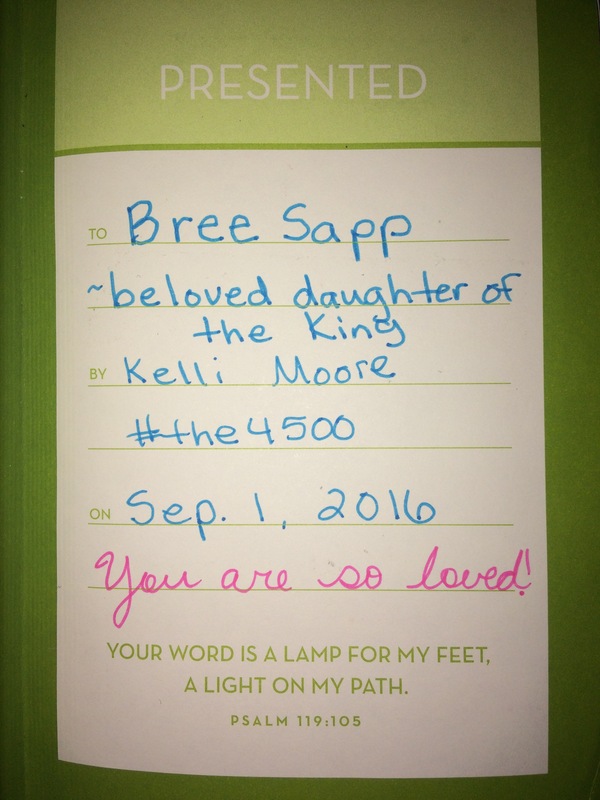 As for the woman who sent me my Loved Bible, Kelli Moore, we are now friends. Though we’ve never met, we hope to one day. We message often and talk sometimes. She is my beloved friend, a beautiful woman, and an angel sent by God; the hands and feet of Jesus that loved on a Bible just for me. 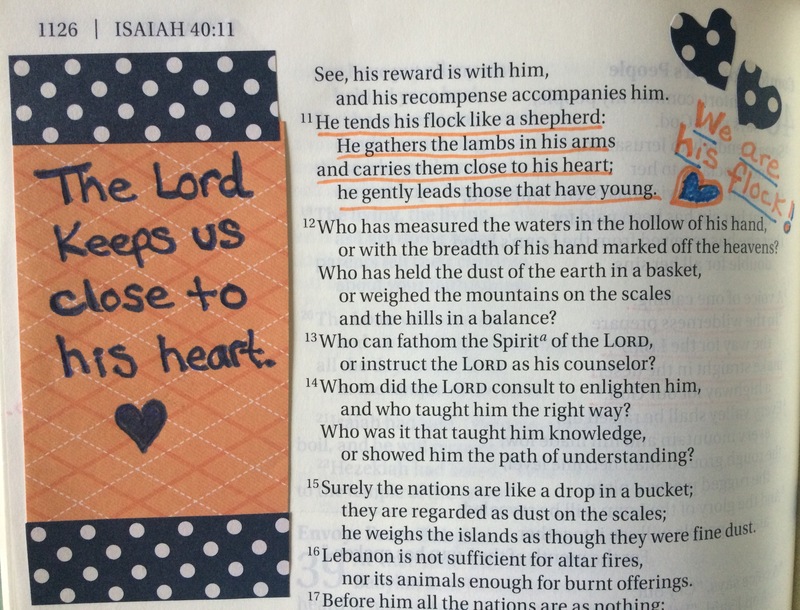 And, because of her generosity, I am loving on Bibles for others. The following 3 pictures are of the Bible I received in the summer of 2016. 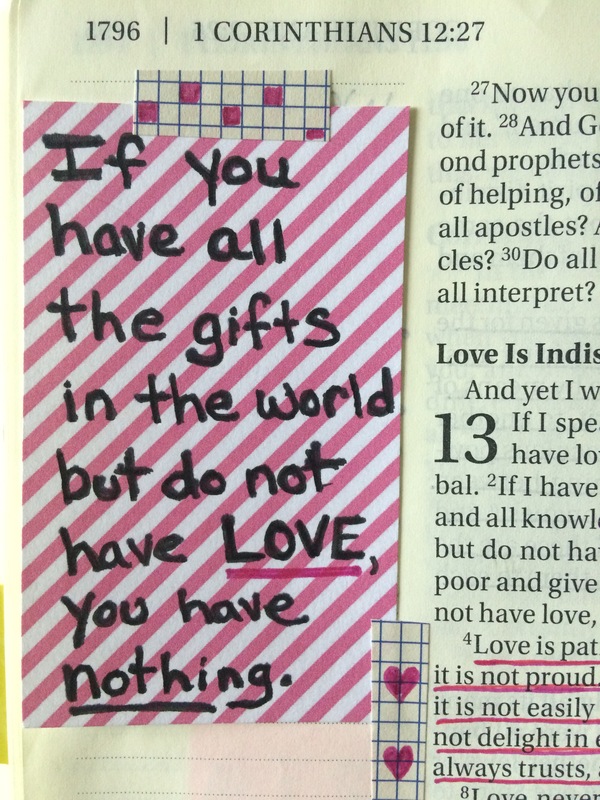 These pictures are from the Bible I’m currently “loving” for someone else.